On Monday, NASA announced some surprising results from its exploration of Gale Crater on Mars by the Mars Science Laboratory rover Curiosity. 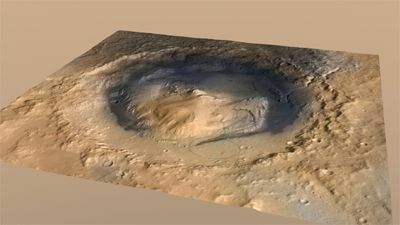 The crater was once the site of a vast lake—and not merely a fleeting puddle of moisture that came and went early in Mars' history, but a lake that appears to have filled Gale Crater, dried up and filled it again, repeatedly over a much longer period than wet conditions were believed to have persisted. Not long after Curiosity began exploring the rubble-filled bottom-lands at the floor of Gale Crater, it began to find clues that liquid water was present there at some time in the distant past. Most recently, Curiosity has investigated a 500-foot-high section of exposed sedimentary rock at the base of the mountain--called the Murray Formation--the rover's first peak into the layered geologic history of the crater. The layers of sediment appear to have been laid down by alternating river, lake, and wind deposition, indicating a cycling between wet and dry conditions in at least the local climate that repeated many times over perhaps tens of millions of years. If this interpretation of the geologic evidence is correct, during wet periods water entered the crater in rivers flowing down the crater walls, possibly supplied by thawing ice or snow accumulations in the surrounding higher ground. The inflow carried large amounts of silt and sand and deposited it on the crater floor. Then, the climate changed and the lake waters dried up, leaving the lake bottom bare and dry and exposed to deposition of dust and sand by wind action, adding a layer on the water-deposited bed. Then, another wet period arrived, the lake filled again, and more water sediments were laid down. And so on, many times, over a long period. Were the conditions at Gale Crater driven by cycles of global climate that formed similar environments elsewhere on the planet? What this implies about other regions of Mars is not yet clear. Were the conditions at Gale Crater driven by cycles of global climate that formed similar environments elsewhere on the planet? Other missions have found evidence of past liquid water on Mars, but were not able to tell us how long it lasted or if it came and went cyclically, as Curiosity's investigations have revealed. The prospect that liquid water was present and stable on Mars' surface over long periods of time also enhances the conversation about the possibility that life could have appeared there at some point. 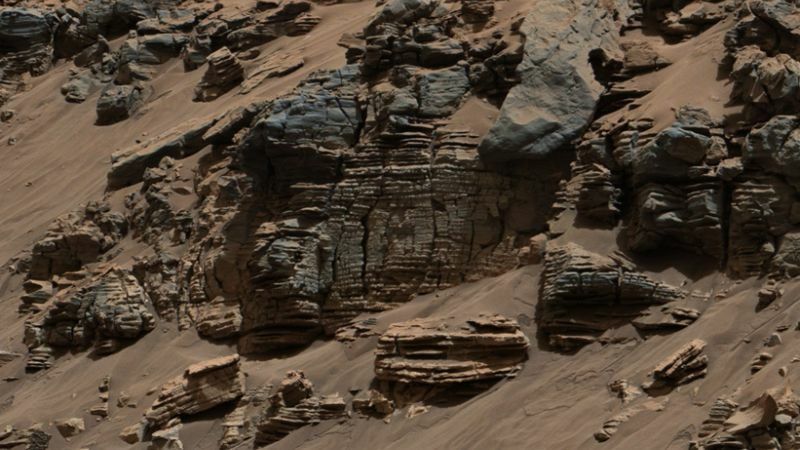 We have not found evidence of life on Mars so far--but how cool would it be to find a fossil in one of those layers of rock? As Curiosity climbs up the slopes of Mount Sharp, it will encounter higher formations of sediment laid down at later times in Mars' history, giving us a more comprehensive profile of the changing climate than those represented by the rocks at the rover's current digs. The ancient lake that once filled Gale Crater must have been a fantastic sight. If you've ever seen Crater Lake in Oregon and were impressed by its size—well, Crater Lake is only five miles wide. Gale Crater, as it is today, is 96 miles across!